This barbecue pimento cheese may just be the best thing that could happen to you today. One taste of this slightly spicy Southern spread with a cult following and you’ll understand. 1. Toss all the spices in a small bowl and stir together. 4. Stir the spiced mayo into the cheese mixture until everything is well blended. You want the cheese to be completely coated with the spiced mayo. Stir in the pimentos. Cover and refrigerate the pimento cheese for at least 2 hours and up to several days to let the flavors meld. (The longer you let the flavors meld, the more mellow the spices and the more pervasive the smokiness. You may want to let the barbecue pimento cheese at room temperature for 30 minutes or so to take the edge off the chill before serving.) For serving inspiration, well, just use it as a dip or spread for anything. Barbecue Pimento Cheese Recipe © 2014 Perre Coleman Magness. Photo © 2014 Jennifer Davick. All rights reserved. All recipes and photos used with permission of the publisher. Being from the North, I never experienced pimento cheese on an appetizer tray or even thought about it. However, after moving South, I see it everywhere. 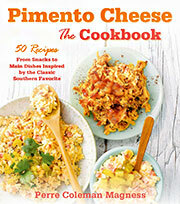 Not having a point of reference, my tasters thought this barbecue pimento cheese recipe was quite good and addicting. I noticed some pimento cheese recipes contain cream cheese, which would make it creamier, although we didn't miss it in this recipe. The barbecue pimento cheese does need to sit and "mature" for several hours, as there was a difference in taste between when I first made it and several days later. I thought the barbecue flavor was a little overwhelming when I first made the recipe, but it has since mellowed. It took about 15 minutes to mix together the recipe. I put it at the back of the fridge so people would really have to work at moving things to get to it. Now we can enjoy it longer—or make it again! My guests were very happy with this barbecue pimento cheese. I served it as an hors d'oeuvre with a simple assortment of crackers. I couldn't find orange smoked Cheddar cheese but the applewood smoked Cheddar I used was perfect, and I'm sure it provided the same degree of smokiness as a naturally smoked orange Cheddar. I halved the recipe, and the yield was about 1 1/2 cups. I like the fact that the recipe uses scallions instead of onion since the onion in my other pimento cheese recipes tends to make the dish a bit watery. The recipe takes about 15 minutes to prepare and then at least 2 hours in the fridge for the flavors to come together nicely. There will be a bit of the spice blend left over. Since the ingredients were so similar, I simply added it to my container of homemade spice blend that I use on barbecued ribs and chicken. I couldn't tell how long the cheese would keep in the refrigerator since my tasters finished the entire dish in one sitting! This barbecue pimento cheese recipe made the perfect appetizer for our New Year’s Eve dinner. Be warned, make the recipe a full day ahead, as 2 hours was not long enough for the seasonings to meld. At 2 hours, I felt the taste was incredibly salty, though at almost 24 hours the taste was deliciously smoky and only slightly salty. The barbecue pimento cheese affixed nicely to water crackers. Here's the deal: I am a pimento cheese purist. The only thing I mess with when making a pimento cheese recipe is using Hellman's mayo if I don't have Duke's on hand. But that's it. Mayo, grated Cheddar, salt, pepper—DONE! If you want to get fancy, stir in some flavored salt or some hot sauce. That does it. But this barbecue pimento cheese recipe made a believer out of me. Really. Yes. I will make it again, but I will make it by dumping everything all in one bowl and mashing it all together the old-fashioned way. One bowl, one spoon to lick, and have some crackers on hand to make sure it is as good as you remembered! This makes great sandwiches, but its real value is that it makes a great grilled cheese sandwich. And it's also delicious with crackers as a dip or spread. I could even imagine it on top of a bowl of great chili. After following the directions, I put the pimento cheese in the fridge for the required 2 hours. Such a shame. People, it is great just fresh from the making and before it gets so cold you almost can't taste it. Pimento cheese bliss! That little jar of diced pimentos brought back memories, as my mom kept the little jars in her pantry all the time. It seems pimento cheese is a staple in the South, and now I've got a smoky barbecue pimento cheese variation to make. We loved the mild onion flavor of the scallion. I ended up adding an additional 2 tablespoons mayonnaise to keep my mixture from being dry. Both when I was growing up and with my own family, the traditional way to eat pimento cheese was always on Ritz crackers and soft white bread. I did an updated version this time and grilled the pimento cheese between 2 slices of Tuscan bread—yummy! We also dipped sturdy potato chips and pita chips in the cheese. I was grilling a pork tenderloin the next day and used the leftover spice rub to roll the tenderloin in before grilling—it worked beautifully. A container of pimento cheese in the refrigerator is a welcome sight in any home! I grew up on pimento cheese and have always loved the stuff. Ours never had scallions or onion of any type. I made this recipe but divided it in half, and I added 2 scallions to one portion, and the other half I left without them. The barbecue pimento cheese with scallions was very strong and overpowering for us. The one without the onion was over-the-top fantastic. I couldn't find orange smoked Cheddar so I used a white maple-smoked Vermont Cheddar by Grafton Village. My hands-on time was 17 minutes with a total time of 2 hours, 17 minutes to allow the flavors to get happy. I will make this recipe again and again (without the scallions). “That’s tasty!,” said one of my tasters after her first bite of this winning pimento cheese plus barbecue combo. And then she went in for the second taste. This despite my barbecue pimento cheese being a drab shade of brown, the result of using white Cheddar and white smoked Cheddar, which were the two cheeses available to me instead of orange Cheddar. I wondered if it bothered anyone that it was brown, but as the cheese was rapidly devoured, I had to believe it wasn't an issue for anyone but me. I served it plated with crackers and celery, both of which worked well. I liked the crunch of the celery just a bit more than the crisp and salty crackers. I served it the day after I made it to let the flavors meld, and I managed to keep it just one day more before it was all gone, so no chance to test the recipe's purported one week lifespan. (Full disclosure: I was predisposed to liking this recipe right from the first read, as I love directions that tell you your hands are the best possible tool.) I could think of lots and lots of things to do with the spice mix, but there was an insignificant amount left over. I was concerned I had done something wrong but then did the math forwards and backwards. The spice mix totals 2 tablespoons plus 1/8 teaspoon, and the recipe calls for 2 tablespoons, leaving just 1/8 teaspoon left over. This amount of spice mix seemed proportionately correct for the amount of cheese plus mayonnaise, so I just tossed it into the barbecue pimento cheese. I had a dear friend whose diet from elementary school through high school consisted of various chocolate treats and pimento cheese sandwiches. I remember opening the foil-wrapped sandwiches when we used to play together and biting into what was basically Cheez Whiz with pimentos slathered on Wonder Bread. This barbecue pimento cheese, however, is not my childhood friend's pimento cheese. It's about as sophisticated as pimento cheese can get, with a strong array of spices (more like a salt cure or dry rub than something redolent of, say, barbecue sauce), two types of Cheddar, and a sturdy texture. I found it to be extremely salty when I snitched a taste before chilling it, and I'm still not sure if the saltiness mellowed over time, or if I just became immune to it as I ate more and more. Either way, I’m a big fan of salt and was all too happy to counteract it with the somewhat sweet Prosecco I was imbibing on New Year’s Eve. (FYI, it makes a good, simple party app and is cheap to put together if you already own a lot of spices.) If you aren’t a salt fiend, go easy on the added salt, and rinse the pimentos well if they’re packed in salt. Note that the result of the recipe is more cheese ball-like than sprinkleable or diplike, so you’ll need some sturdy dippers to be able to scrape chunks off. I used pretzels and Wheat Thins. I suspect it’s best served as an appetizer. A grilled pimento cheese sammich could be good, too. Obviously, the better the Cheddar, the better the cheese ball, so do buy some of good quality. You may need to check the gourmet cheese section of your store for a smoked Cheddar. I’m curious what this would taste like using homemade mayo, pimento-stuffed olives, and/or served hot and melty. As long as you like Cheddar, you really can’t go wrong. If we’re getting technical, there should be an 1/8 teaspoon extra, but for those of us not leveling our measuring spoons, we’re probably gonna throw it all in. Truth be told, I’d prefer a little less spice mix (like 1 1/2 tablespoons) as the result really was quite salty and powerful. After being introduced to pimento cheese with the classic recipe on this site, we were very willing to try another variation. For this barbecue pimento cheese recipe, I finely grated the 2 cheeses and premixed the spices ahead of time. Once everything came together in a creamy spread, I couldn't resist a teensy sample before putting it in the fridge to chill. It had a nice smoky barbecue flavor. If you want a little more texture, use the larger side of a box grater. After trying both a coarse and a fine grating, we slightly prefer the texture of the larger grater, but the flavor is still excellent with a lot of depth and just enough heat. If you don't have celery salt on hand, you can substitute a 50/50 mixture celery seed and kosher salt and grind them together. If you do not find smoked Cheddar (I had to be persistent), I think a smoked Gouda would do. Any spare spice mixture (just a bit will be left over) will go nicely on a baked potato or sweet potato. Besides spreading this on crackers, I would like to serve it with celery sticks, old-school and retro style. I made this for a party recently, and to say it was an enormous hit is an understatement. No fewer than 15 people asked for the recipe, and when there was no more cheese ball, one of my guests rolled up every single one of the leaves resting underneath (radiccio, cabbage, etc. ), and ate those too. There is a mistake in the recipe. It should read “one cup Duke’s ® mayonnaise”. Hah! Love this. Love you. Thanks for the best chuckle I’ve had all day.